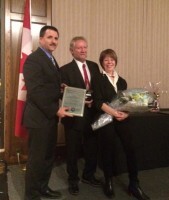 The Windsor University Faculty Association (WUFA) congratulates Professor Brian E. Brown on being awarded the Charles E. Brooks Labour Community Service Award at a celebration dinner on November 18, 2016, presented by the Windsor & District Labour Council in recognition of outstanding contributions in the area of volunteer community service. 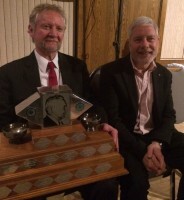 Prof. Brown, who is a past president of WUFA and a current member of the Executive Committee, has “gone above and beyond to make a difference in Windsor and Essex County.” He was presented with a unique gold signet ring and an award plaque. On behalf of WUFA and all of its members, Congratulations Brian on this well-deserved honour.